Depending on how you view things, I noticed that I missed a milestone of sorts with my previous post. This is Post 501 for me on this, the beginning of my fourth year of blogging. There have been several milestones along the way: getting visitors–surfers or anyone–period; getting a comment from someone other than family; I was elated when that finally happened regardless of my blase′ notation in one of my “about” pages saying something like “comments are not required but are appreciated“; I cheered out loud when I realized I finally had a random reader or two. Seeing my visitor’s log inch along in the single, then double, and finally triple digits until it got to 1000 was so exciting; now seeing it limp along to 6 digits–which, if the trend continues, is only a few weeks away. Maybe not worthy by some bloggers’ measures, but gratifying to me nonetheless. In spite of looking forward to number 500 awhile back I upped and let it slip by me without notice. I’d assumed I’d say something but didn’t. All I can really add one post later is that, after three years, I’ve finally figured out (I think!) what my wintersong is all about and why I continue, even though sometimes I feel like a glutton for punishment–when life gets too hectic or posts seem ignored. I’ve never been able to pen myself in to a theme, so the best I can do is tell you what it isn’t about. It isn’t about politics. There are many and far better political writers than I. It isn’t about whining about the ways things are, although I’ve done a bit of that too when I’ve felt despair over health care and greediness in this country–insurance companies and the ever-widening gap between the haves and have-nots, the I’ve got mine, you get your own and leave mine along attitudes being only a drop in the bucket of doom. That’s a good example of why I don’t usually write about things like that! Too depressing. When I first started, still trying to figure out what I wanted to write about, I’d read advice about giving things away for free to attract people. The way I figure it, if they only visit to get something for free, they aren’t really interested in me or anything I have to say, therefore I’ve little interest in them. To each his own. I suppose if your purpose is to make money blogging and money is determined by the number of clicks on product leads or popups on your blog, that could be important. I’ve been approached by products wanting me to write for their product, but that isn’t for me. I just wanted to write. I wanted to write better. I wanted to share what I knew about writing and other pursuits I enjoyed–cooking simply, growing older, enjoying my worldwide wanderings by writing about them, or anything that happened to catch my fancy along the way. I enjoy presenting some of my thoughts in a tongue in cheek manner, hoping it brings a smile to my reader’s face. Laughter is even better. Once in awhile, readers didn’t catch on to my farce. I’ve never been able to figure out if it’s my fault or the readers. If I pick up a book to read, have trouble sticking to it and eventually lay it down and never pick it up again, is it my fault? (Maybe I’m in a particularly busy point in my year.) Or is it the writer’s fault? If they’d just written it well, I would have been compelled to turn the pages regardless of how busy I was? I don’t know. At least now I don’t worry about it anymore. Too many books and too little time to waste reading books that don’t grab me and hold my interest whatever the reason. I write quite a bit about days past. That’s no accident, because I think its each generation’s obligation to pass along the stories of how they lived and grew up to their own family. It may help others understand why you are the way you are. I believe in remembering where I came from, the better to appreciate where I am. It may not be important to all, but for some reason (genes?) that’s how I feel. I’ve known many others along the way–most of them writers, too–who would agree with me. If I can bring a sense of “Yes! I understand what you mean . . . I’ve been there, and I remember.” Whether it’s a happy memory or not, it serves to validate, and validation of our lives is what I believe is missing for too many people, especially as we age–as if our lives were only an accident after all. Summing it all up, I can see that Blogs for me are a sort of replacement for the porches of our parent’s or grandparent’s and consequently realize what they’re so attractive to people of our generation probably as a result of our wandering ways. I vividly remember my grandmother sitting on her front porch when she finally had free time in her older years. Living alone out in the country where she may not have had real visitors for several days, she’d sit in her rocking chair reading and watch the world go by. Now and then a car or truck would pass by and the occupant, most often someone from a neighboring farm taking care of an errand that required a trip to town, would throw up their arm in greeting, and she would respond in kind. Waves required no stops, the fact that she was okay was obvious in the style of the wave–had she needed help, she would have waved him down or yelled out–so they could go on about their business and feel good that all was well in their worlds. Even where porches exist, in this day and age most people don’t sit outside, or if they do, they don’t often wave to passersby anymore. They don’t have time, or privacy is paramount. Not wrong, just a different way of life. The way I see it is My Wintersong is my metaphoric front porch. I go there to reflect and “talk” or wave to my blogger friends scattered about the world, just to say I’m still here and I see you are too. I may not see you every day, but I’ll be by now and then to check on you. If you need anything in the meantime, just throw up your arm and wave me down. This entry was posted in Musings, Paradigm Shift, Personal by Alice. Bookmark the permalink. Thank you for always welcoming me to your porch. I don’t always talk, but I do keep stopping by. I love stopping by your front porch!!!!! AND I really do have an old fashioned front porch and often sit on it and watch the world go buy. Since I do write about politics sometimes, I remember that my city’s favorite son is President William McKinley who ran for President from his front porch here so there’s a precedent — especially since I live very close to his memorial. Our blogs are our home here in cyberspace and I think we should ‘decorate’ them to our own taste and purposes. Thank you for your candor in expressing yourself and congratulations on your 500th post! You keep writing your wonderful posts and I’ll keep reading them!!!! And thank you for being a great friend! 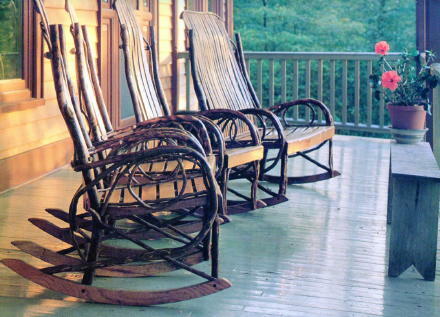 Love this post – wish I had a warm front porch to sit on with you but for now, this is a great way to get together. 😉 I admit I’m guilty of using a photograph without credit or permission. It was from an old calendar published from Algonquin Press. Doesn’t everybody save their calendars? I have some going back to 1980 with notations all over it–like the journals I never kept. That’s how I know what I did every day we were away on my very first visit to India. All I have to do is note what we did and the day comes flooding back–even my mood and what I was thinking or worrying about come flooding back! Thank you for stopping by my blog and commenting on the photos. I can take hundreds to end up with just one or two that work. I often don’t have much to say but I like to take pictures. Blessing on digital cameras! Your grandmother sitting on her front porch just reminder me of the movie “Second Hand Lions”. The two brothers would sit rocking on their front porch they waited for the next traveling salesman to wander by. The one that’s in my head now is the shot of the bird flying in for a landing on the boat railing and you got it skidding in on its chest! Fabulous! I’m glad you got it even if it took a hundred shots! Thank heavens for digital; I’d be lost if I had to go back to film and print. You and the missus both have good instincts for what makes a great picture. PS: Your comment wasn’t lost at all. You suddenly became anonymouse. 😉 Better a mouse than lost. They can see in the dark y’know! I am one of those random passers-by that discovered your blog when I Googled Tonette Home Permanents. Your post about the dreaded yearly ritual of perming popped up, I clicked on and have been a follower ever since. That was nearly a year ago when I finally started my own blog. Reading Wintersong inspired me to continue. I’m not sure how many entries I’ve posted since April ’09, but it’s not a bad start. Now I can’t imagine my life without examining it through blogging, and I can’t imagine days without reading Winterson. Thanks for your inspiration! Thank you all for your comments. I had the best of intentions to answer each personally, but due to an excessively busy week of classes and lectures and house chores that I’ll go into more detail about in a later post, time just got by me before I knew it. Your support means a great deal to me. I hope you’ll come by regularly, and I see you at your place often too. I understand completely Sylvia. At times I get so darned busy I don’t get around to answering comments to my posts; sometimes my own blog reading gets delayed several days and I always feel like the last one to the party. My porch will be there, whenever you have time, stop by. Like Motel 6, I’ll leave the light on for you. And thanks so much for your supportive words and encouragement.